This out Jeopardy contestant won almost $100k. And our hearts. When John Presloid walked on the Jeopardy stage, he had no idea he was about to win big. The game show contestant brought home almost $100,000 but with a few nonchalant words, he became a true champion. Presloid, who lives in a small community outside of Toledo, Ohio, talked to LGBTQ Nation about his win – and becoming an inspiration to countless LGBTQ kids. The four day champion had to stay mum about his big winnings until the show aired. But on his fourth day as the champion, he hit the Daily Double. Twice. The first time he bet his entire earnings, but when host Alex Trebek encouraged him to do the same the second time, Presloid’s nonchalant mention of his husband didn’t register on set – but it did with viewers. 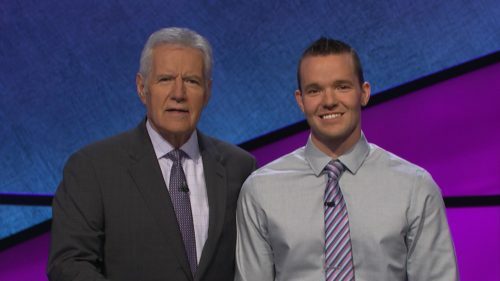 He declined to bet $27,600 for an answer in the “Poets” category – even though if he had made the wager and won he’d have had a chance at becoming the contestant with the highest score ever recorded for one episode. “My husband would kill me,” he said as he smiled brightly and the audience chuckled. He wagered $400 – and correctly answered the question. Presloid pointed out former contestant Louis Virtel who, after becoming internet famous for a giving a big circle snap after winning a Daily Double himself in 2015, admitted that his biggest regret was being recognized as a gay man from stereotypes, but never actually saying he is gay. Presloid says the reaction to his casual reference to his husband sparked a chord in small town teens across the country who reached out to thank him for being a “role model” when they couldn’t find anyone else. A Talent for Finding Daily Doubles | JEOPARDY! A true Daily Double is a great way to get ahead of the competition! Here are the highlights from John's 4th victory.